Born under the same star sign as the Ozric Tentacles and Omnia Opera, Ohead (What is it with Brit neo-space rockers and the letter "O"?) mine the psychedelic ore of the asteroid belt and refine it into a diffuse mixture of trance, ambient, dub and blazing rock. This is particularly evident on the title track with its driving sequencer pattern and lock-step drums. Ohead pilot David Hendry charts a course through the cerebral cortex with some searing lead guitar, hovering pads and dive bombing noise sweeps. A Thousand Stars and a Thousand Moons features mesmerizing sequencers against a backdrop of coiling synths and slash and burn guitar. Hypnotic and yet hyperactive at the same time, it trails off into an ocean of bubbling electronics and diaphanous synth textures. The house vibe of Subliminal Conditioning seems a bit dated these days but the inclusion of some slinky sax work and a vibrant rhythmic bass save the song from being merely sonic trivia. Meadow of Dreams brings the listener back to more rarefied atmospheres, with its floating synths and ostinato bass line establishing a repetitive calm punctuated by some airy acoustic guitar and crescendoing strings before transitioning to an up-tempo coda that features more blistering lead guitar set against a background of icy synth pads. The 13-minute Infinite Possibilities is unquestionably the album's centerpiece, evolving as it does through different sections evoking subtly different moods, very much, for instance, in the tradition of mid-70's Tangerine Dream masterworks such as Ricochet and Stratosfear. Here particularly is where Ohead excels at its Berlin School-derived electronic and Ozric-fueled post-Gong/Hawkwind space rock. Phased metallic guitars anchor the otherwise shifting sequencers and atmospheric pads to terra firma before the piece morphs into a kind of electronic saraband for 21st century stoners. 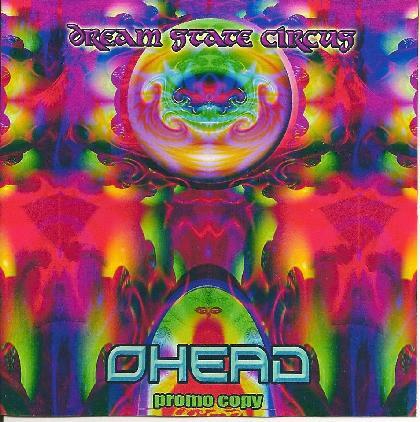 All in all, Dreamstate Circus is an excellent addition to Ohead's growing galactic catalog of neo-psychedelic trance rock. Where the Ozrics left off at the end of the last century, Ohead forges ahead in this one.